OK, I admit it - these weren't constructed entirely without computer assistance. Usually I write some C code to generate whatever the shape is and figure out which cells in a grid made up of 1x1x1 LEGO bricks should be filled in. The code outputs this as an LDraw .DAT file, separated into construction steps adding one complete layer of the structure in each step. Then I use MLCad to view the .DAT file. I play around with the parameters and repeat until I have something that looks nice and which will probably be able to balance. But that's the easy part. Now I have to try to construct it out of actual LEGO bricks so that it actually holds together. Worse, I have to use the collection of bricks actually in my possession and not currently in use in some other construction [in case anyone's interested, I've convinced myself that this is, in general, an NP-hard problem. One of these days I'll write up the proof]. This usually takes far longer than the first stage - and a few times I've had to give up. Occasionally I cheat just a teeny bit and deviate from the output of my code in order to help the structure hold together. I used to be able to say that all the models shown on this page were constructed using only the 1xN and 2xN standard bricks you can find in the blue bulk tubs. No plates, no L-shapes. That was until I built the Costa surface. I just couldn't make it hold together with bricks alone, so I gave in and used a few small plates too. Various sizes of Mobius strip. These were the first mathematical sculptures I attempted. The big one was about my fourth (and I had to cheat a little bit with the top two layers to make it hold together). It's 37 bricks high and balances on a footprint contained in a 5x9 rectangle. It is essentially one brick thick throughout. A friend at work suggested this after seeing the Mobius bands. This was my first attempt. It is very flimsy (and I cheated in two places by modifying the collection of occupied cells output by my program). Still, it proved it was possible. I made this thicker than the trefoil knot in order to help make it rigid. Nonetheless, I think this is the most difficult single construction I have ever made out of LEGO. Those long sweeping curves, hanging unsupported in space... It's only when you get about 2/3 of the way up that you start to discover exactly which bits 1/3 of the way up aren't strong enough. And there are never enough 1x3 bricks... But I didn't cheat anywhere. I'm very pleased with this. The figure-eight knot has a nice tetrahedral skew-symmetry which the model illustrates quite well. 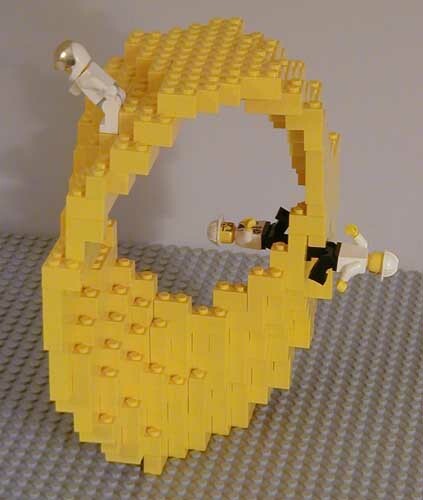 Until I made the Klein bottle, this was the largest of all my mathematical LEGO models. Despite the sheets being only one brick thick, the construction is remarkably rigid. I think this probably has to do with the zero curvature of the surface. though I don't really understand what's going on. A couple of people asked about a Klein bottle, so here you are. I spent ages finding a nice parametrization of this, so I hope you like it. I wasn't very happy with the first one, so here's a completely different rendering of the cross-cap in 3-dimensional space. This was a bit of a challenge, but I've wanted to do one of these for ages. The most elaborate and difficult yet. It left me with exactly six unused 1x3 yellow pieces.